The Spider Veloce is a Duetto with a 1750 engine. It's hard to see the difference between a Duetto and a Spider Veloce. 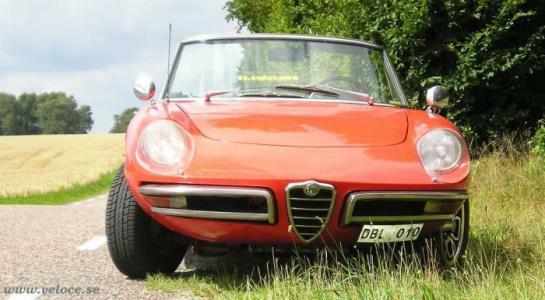 The name Duetto was abandoned when Alfa Romeo changed the beautiful round tail to a Kamm-tail. The name Duetto was the result of a contest which evidently produced nothing revolutionary in naming the new spider 1966. There was also a biscuit with the same name and even Volvo had a car named Duett, a delivery wagon. Ever wondered why racing cars in Europe have different colors? Italians are red, French blue, British are racing green. Germans are silver bright since the Mercedes were beaten by Bentleys on Le Mans in the '30s and they scraped of the paint in order to gain a reduced weight. Actually Mercedes sanded off their white paint because their races cars exceeded the permissible curb weight for the race by four pounds. The Germans in classic Teutonic order had designed the cars to fall just under the permissible weight, but they had failed to take into consideration the fluids in the vehicle. So when filled with oil and coolant, the cars exceeded race rules. The engineers then decided to remove some part of the car that was unnecessary. The only thing that they could think of was the paint. They won well that year so they changed their official race color to silver. The red color is still an Italian racing favorite and I am quite pleased with my Rosso Farina, AR514.